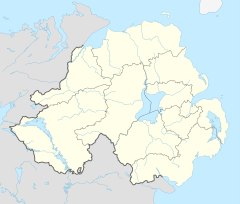 Magherafelt (from Irish: Machaire Fíolta, meaning "plain of Fíolta") is a small town and civil parish in County Londonderry, Northern Ireland. It had a population of 8,372 at the 2001 Census. It is the biggest town in the south of the county and is the social, economic and political hub of the area. It is part of Mid-Ulster District. Magherafelt has been documented as a town since 1425. Following the Plantation of Ulster, a central diamond has formed the heart of the town. During The Troubles in the late 20th century, 11 people were killed in or near Magherafelt in connection with the troubles. Magherafelt railway station opened on 10 November 1856, shut for passenger traffic on 28 August 1950 and shut altogether on 1 October 1959. Magherafelt has several sporting teams, including Magherafelt Reds, O'Donovan Rossa Magherafelt GAC, the Rainey Old Boys Rugby Club and Magherafelt Sky Blues F.C.. There is also the Mid Ulster Athletic Club,Spires CC Cycling Club. the Mid Ulster Swimming Club and the Magherafelt District Motorclub. ^ The Online Scots Dictionary Retrieved 11 June 2012. ^ "Magherafelt station" (PDF). Railscot – Irish Railways. Retrieved 3 November 2007. Wikimedia Commons has media related to Magherafelt. This page was last edited on 13 February 2019, at 16:33 (UTC).